LG has finally announced its most-anticipated flagship of 2017 – The LG V30, in an event in Berlin at IFA 2017. This is the true flagship of the company and arrives with top-notch specifications, as one would expect from high-end smartphones. Unlike the LG G6, it is powered by Snapdragon 835 chipset, which is a comprehensive upgrade over G6’s Snapdragon 821. The V30 handset features a 6.0-inch P-OLED display covered with Corning Gorilla Glass 5 at 1440 x 2880p resolution. The key highlight of this smartphone is its rear camera. On the back side, the device boasts dual rear cameras, where the first one is 16MP, f/1.6 while, the another is 13MP wide-angle lens sensor to capture wider snaps. The combination provided by LG seems good enough, to take some decent photos. Also, it is capable of recording up to 4K videos, On the front side, a 5MP shooter is present for selfies. Regarding storage, There are two variants with 64/128GB storage options, coupled with 4GB of RAM. A 3,300 mAh battery backs the handset with given fast charging support. When it comes to durability, the device is MIL-STD-810G along with IP-68 rating against water and dust. So, we can easily assume how durable the phone is. Apart from that, QuadDAC is still there to gives an enhanced audio experience. It runs on Android 7.1, Nougat, but we can expect Android Oreo very soon. All in all, the device looks quite promising and a measurable upgrade over LG V6 and V20. Rear Camera Dual 16MP, f/1.6 + 13MP, f/1.9 (wide-angle), LED flash, 2160p 4K Rec. 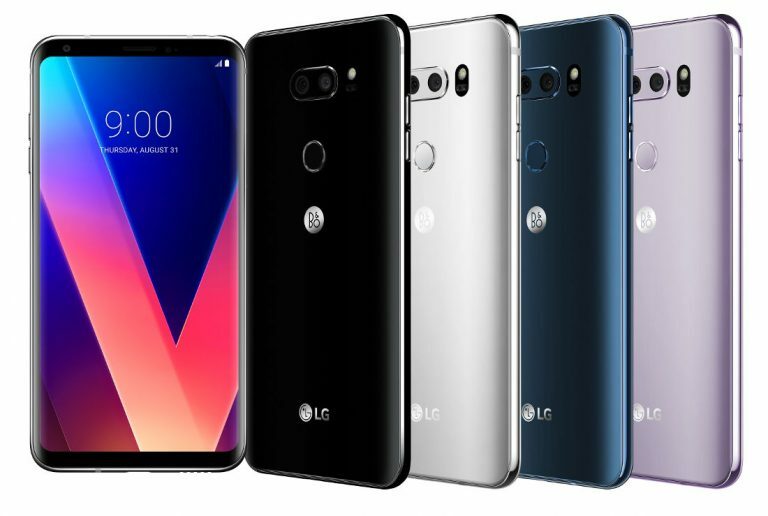 The LG V30 comes in Aurora Black, Cloud Silver, Moroccan Blue and Lavender Violet color option and will roll out starting from Korea starting from September 21 followed by North America, Asia, Europe, Africa and the Middle East. Unfortunately, we have yet to know about pricing details as live stream is going on. Pricing details will be updated in this post, just after getting information.